Being primarily a console gamer, it’s been a while since I needed a proper gaming mouse; my R80 Logitech has been serving me well for my day to day business needs. 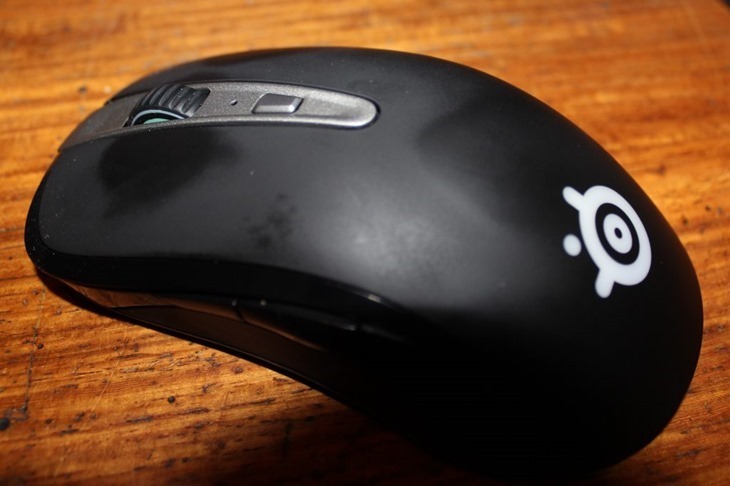 However, with some top tier PC titles being released in the near future I jumped at the chance to review the Steelseries Sensei Wireless Laser mouse. I’ve never been a fan of wireless mice for two reasons: first, they always seemed to run out of batteries at the worst possible time; second, back in my PC gaming days the lag from a wireless mouse was very noticeable. 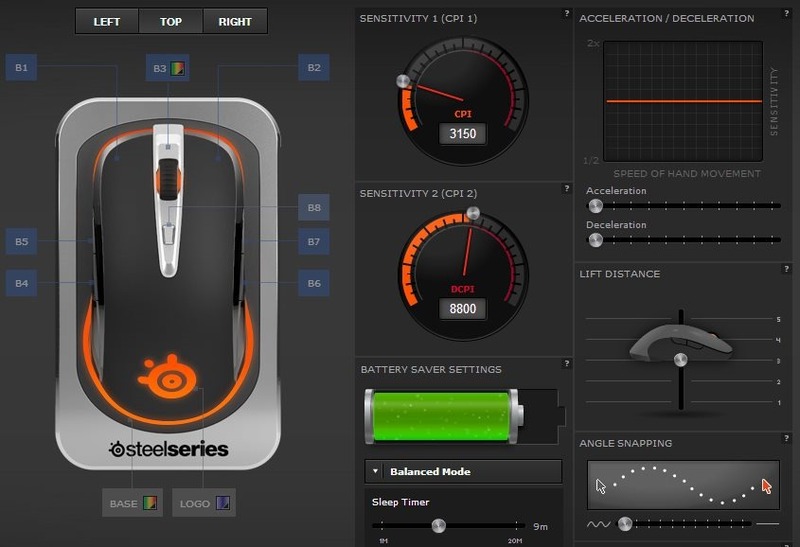 Steelseries have claimed to solve the lag issue with the Wireless Sensei having a polling rate of 1ms which is equal to the wired version of the Sensei mouse. The speed reading of 150 inches per second is also a match for the wired version, while its accuracy of an incredible 8200 max counts per inch is even better than the wired version. The issue around the batteries dying at the wrong time has been solved in two ways. The first way is that they have included a cable so if you run out of power you can simply plug it in and continue working, but the part I find far more fascinating is the inclusion of the charging dock. The dock is a beautifully crafted charging station which comes with a brushed metal finish on top and a rubberised pad underneath to ensure it doesn’t slide around. The dock also has lighting that showcases how charged your mouse is even while it isn’t attached so you are never going to be surprised by your mouse suddenly going flat. The mouse itself has two lighting options with the logo and scroll wheel both having embedded lighting. As with the dock you can set these lights to indicate battery power or you can change them to be whatever colour you like out of a measly 16.8 million colours using the Steelseries software. But changing colours doesn’t make a quality mouse and the software is much more powerful than that. As you can see above we have the dashboard for the mouse. On the left is where you change the colours of the base and mouse and assign actions to the eight action buttons included as well as the scroll wheel. In this dashboard you can also record macros and assign them to certain buttons, eg. you can program stop, drop and roll to a button for those moments when you catch on fire, something I expected to happen more often in life considering how many times the teachers taught that to us. On the right you can fine tune all specifics of the mouse from dual sensitivity options (toggled using the silver button in the middle) which is great for sniping, to even setting the acceleration and deceleration of the mouse to suit your needs. The lift distance is a bit odd and I guess would be good for people who struggle to keep the mouse on the table while frantically gaming. You can also change the angle snapping and polling rate if that is what strikes your fancy. You can set the sleep timer so if you forget to cradle the mouse it will turn itself off and it even has a smart sensor option which will turn the logo off when your hand is covering it to save battery power. The mouse feels great and the iconic Sensei design ensures you will be comfortable gaming for hours on end using. The slightly rubberised top helps ensure your hand doesn’t get overly sweaty but it is exactly here where my only problem with the mouse came in. I’ve been using the mouse now for the last 2 weeks non-stop, mainly for business but also for gaming and the rubber is already starting to disappear from the top as you can see from this picture I took this morning. I do generally sweat more than the average person and it is possible I sweat pure acid as this sort of thing happens to my pillows as well, gross isn’t it? But I would have expected a little better from a top of the line mouse and maybe Steelseries needs to start paying me a bucket of money to stress-test their equipment. The Steelseries Wireless Sensei retails for about R2000 and as such you are expecting to be purchasing a premium product and you truly are. Everything about this mouse is top notch and if looking cool is your thing then you are definitely going to turn heads at the LANs while pulling off epic head shots in game. I was only allowed the review unit for two weeks but unbeknownst to Steelseries, I‘ve moved house, changed my name and they aren’t getting this back unless they pry it from my cold dead hands. Well that’s my plan anyway.